We really enjoyed our stay at the Hilton. There are lovely grounds and many shops around the village. Our room in the Kalia Tower was beautiful and had a wonderful view of the ocean. The hotel is on the quieter end of Waikiki which is nice. Our room was newly renovated and looked out directly on the ocean. This hotel is very large and very busy. Accommodations were terrific and the setting beautiful. Food was very pricey. $15-20 for a continental breakfast. We stored milk and fruit in refrigerator, bought cereal, and ate breakfast on our own balcony. A far better deal. Location was tranquil, surrounded by natural beauty. Elevators very slow in Rainbow Tower. Waited as long as five minutes. Great resort for families and couples - beach is beautiful and the grounds are impeccable. Hotel rooms in Ali tower are modern but not luxurious. 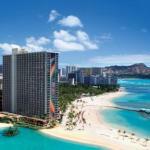 A great place to stay if you want to be away from the excitement of Waikiki beach but within walking distance. Self contained with everything you need on premises. Really dies down at night - everything closes by 10 pm. Hilton Hawaiian Village is a beach front resort located in Waikiki's widest and most beautiful stretch of beach in the tropical paradise of Honolulu, Hawaii. Nestled on 22 oceanfront acres, this "hotel" offers the perfect mix of exceptional hotel accommodations and classic Hawaiian hospitality. As soon as guests arrive, they are surrounded by lush tropical gardens, waterfalls, exotic wildlife and priceless artwork. When they are not enjoying the natura beauty of Hawaii, visitors can explore the "Village Experience," a perfect blend of luxurious accommodations, over 20 restaurants and lounges, shopping, recreational and cultural activities, nightly entertainment and more. With so many activities and amenities to fill the long island days, this is the perfect lodging choice for visitors wanting to soak up the tropical atmosphere while enjoying the luxury of a fine resort hotel. Guests can choose from a variety of hotel accommodations spread among several different towers, each offering a balcony/lanai, coffeemaker, speakerphones, and complimentary toiletries. With so many different choice in so many different price ranges, there is truly something for everyone at the Hilton Hawaiian Village. The Hilton Hawaiian Village offers a variety of amenities to its guests. When they are not enjoying the great outdoors, they can relax in their room with the LodgeNet interactive television enabling on-demand movies and music as well as Nintendo® video games. Work desk, voicemail, and high speed internet access make staying in touch easy. A variety of dining is available on the resort grounds, with choices ranging from traditional Hawaiian fare to pizza. Numerous swimming pools and a range of daily activities, including a full children's program, ensures that guests of al ages will have a fun filled stay. The Hilton Hawaiian Village offers a fully Hawaiian vacation experience with the comforts of a luxury hotel and the amenities of a spa. Guests will feel spoiled from the time they pull through the gates. From valet parking to hot stone massages, this is a place where you can really spoil yourself. The staff are eager to serve and the grounds are a manicured paradise.